High precision statistics for Wowza and Nimble Streamer are popular among the customers who want to know their viewers behavior better. 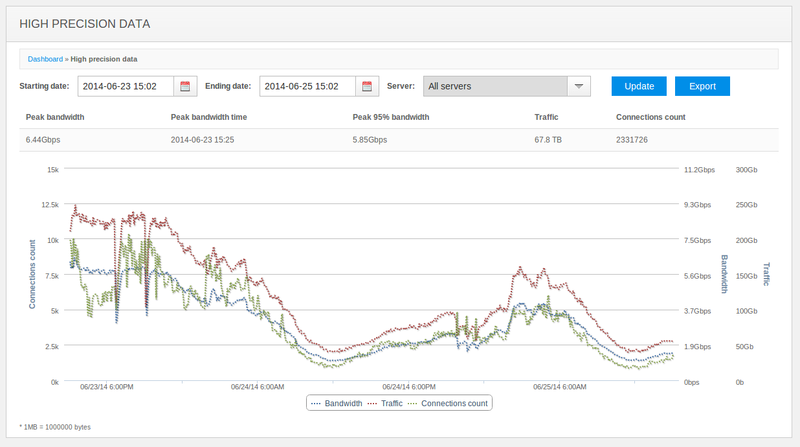 This report provides connections, traffic and bandwidth (peak and 95-percentile) info for each 5 minutes. Comparing to default daily statistics it gives much flexibility. High precision report with 48-hours chart. Now in addition to the overall numbers for a given period and a nice chart, you may also export all raw data in a single CSV file for further analysis. If you need any other statistics improvements, just let us know about it.